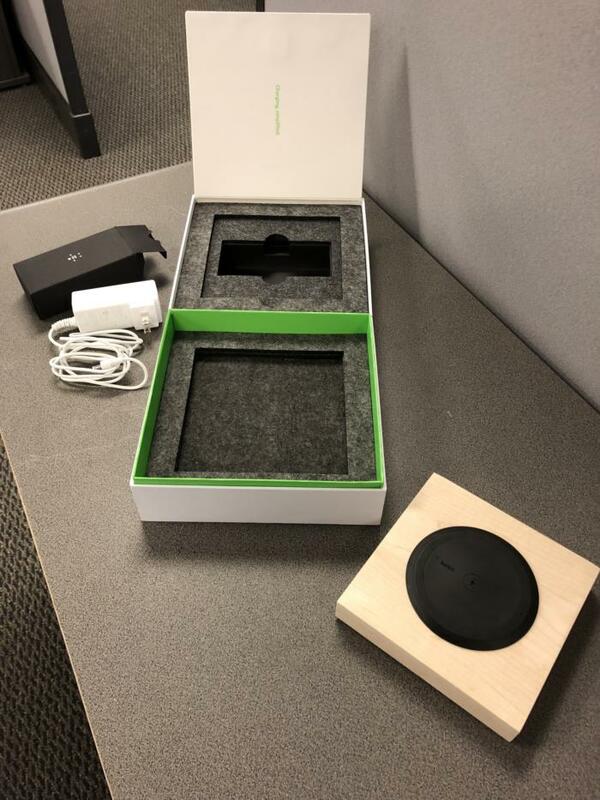 Belkin has released a wireless charging pad that embeds into or under a table-top surface, enabling business users to charge up their Qi-enabled smartphones or tablets without searching the room for an outlet (or their briefcases for a charging cable). Single device charging pads offer modest convenience to consumers when placed on a desktop or bedside table. The only thing they eliminate is the inconvenience of reaching over and plugging in a mobile device. A wireless charger aimed at businesses, BOOST↑UP Wireless Charging Spot, however, provides a far more solid use case for company visitors, employee meetings or simply for workers who don't want to purchase multiple cables to charge a device at home and at work. The review model of the Belkin BOOST↑UP Wireless Charging Spot. The BOOST↑UP Wireless Charging Spot offers up to 10W of current, enough to charge any Android smartphones that can receive up to 9W, and enough to meet Apple's definition of "fast charging" for its Qi-enabled iPhones (7.5W); a typical charger offers 5W of power. Belkin was among the first companies to begin selling wireless charging pads. It has sold a consumer-grade pad capable of offering up to 7.5W of power a year ago. In fact, last year when Apple first announced its first wireless charging capable smart phones – the iPhone 8 and iPhone X – it recommended owners purchase a charging pad from either Belkin or Mophie. 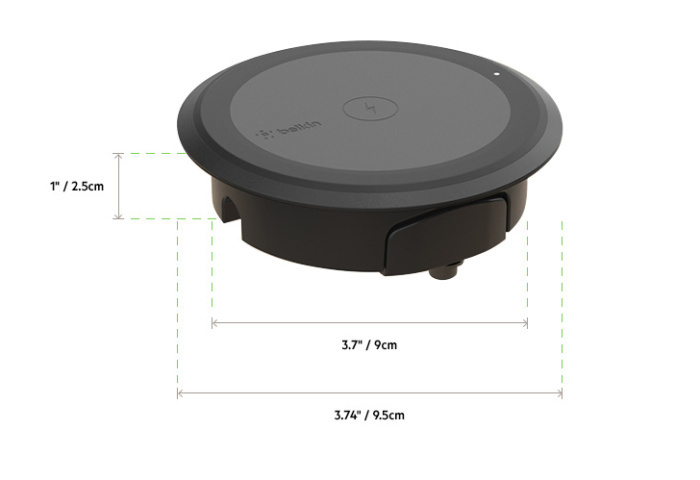 Today, there are more than two dozen companies making Qi-specification wireless charging transmitters, receivers and pads that support 15W fast charging, from Belkin and Toshiba to LG and Zens. They range in price from about US$20 to $100 or more. Over the past three years, Duracell 'Powermat Spot' wireless chargers have been piloted in restaurants, airports and coffee shops. Similarly, they embed in table tops for user convenience. An Apple-designed charging pad, called AirPower, was supposed to be available in 2018 and offer charging for up to three different devices, including an iPhone, an Apple Watch Series 3 and a new optional wireless charging case for AirPods. A year after announcing AirPower, Apple has remained silent about when, or if, it will become a reality. In the meantime, vendors have been more than willing to offer up multi-device wireless chargers that can accept more than one Qi-enabled Android and Apple device. 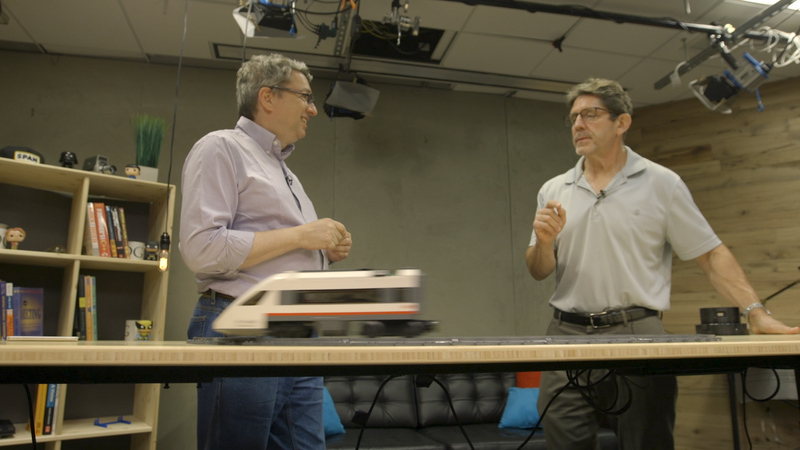 What Belkin has done with its latest wireless charger is target the enterprise market. Embedding the charger into a surface, or placing it below a desktop, deters theft, the company argues. The charger is also water and dust resistant, so with luck, that desktop coffee spill won't short it out. "The included cable-management system keeps public spaces uncluttered and walkways clear to ensure business continues without interruption," the company said via email. While Belkin is marketing the charger to businesses, a consumer could also get ambitious and embed it in a side table or desktop at home. 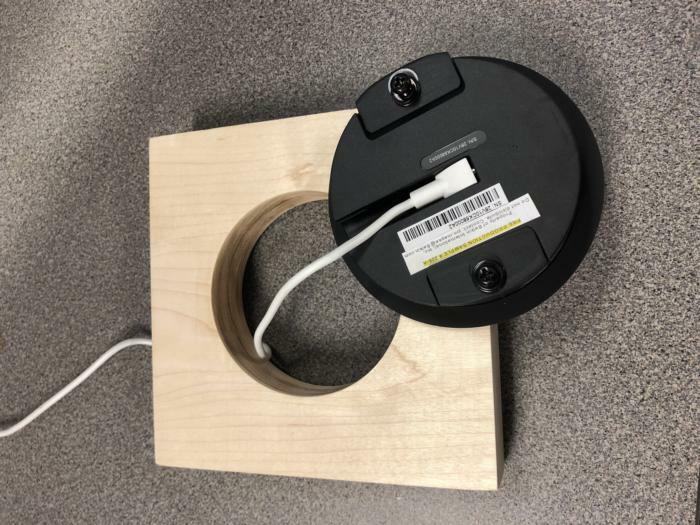 Belkin sells the charger in two configurations: a Surface Mount (SKU B2B170) that protrudes about a quarter inch above the top of a table; and a Flush and Sub-surface model (SKU B2B180). As the name suggests, the latter model rests flush with a table top; the same model can also be placed below a 1mm thick tabletop laminate and the site can be marked with a sticker for easy identification. Installation of the sub-surface model would be no small task, however, as it would likely have to be performed at a factory prior to a desk or table being laminated. The BOOST↑UP Wireless Charging Spot is designed to fit within a standard-sized 80mm grommet hole – the holes you typically see on a desktop that are used for your monitor and computer cabling to access power outlets. Two screws on the bottom of the pad apply outward pressure on plastic wings when turned, holding the charger in place through friction. Belkin's BOOST↑UP Wireless Charging Spot's dimensions. One feature that falls a bit short on this pad is the LED charging indicator light; the light turns on when a phone is connected (many if not most wireless chargers have this feature). However, Belkin's charging indicator is pinpoint tiny and located nearly a half-inch in from the outer edge of the charger – allowing it to be easily covered up by a smartphone or phablet. A better design, in my view, is the one used on Insignia's consumer wireless charger, which has an easy-to-see illuminated edge bezel ring. Another thing I thought poorly designed is the 3¼-in. long power adapter, which consumes the space of up to three plugs on a power strip. Two words of advice for Belkin: Go vertical. Or create a power adapter that mounts to the underside of a table. 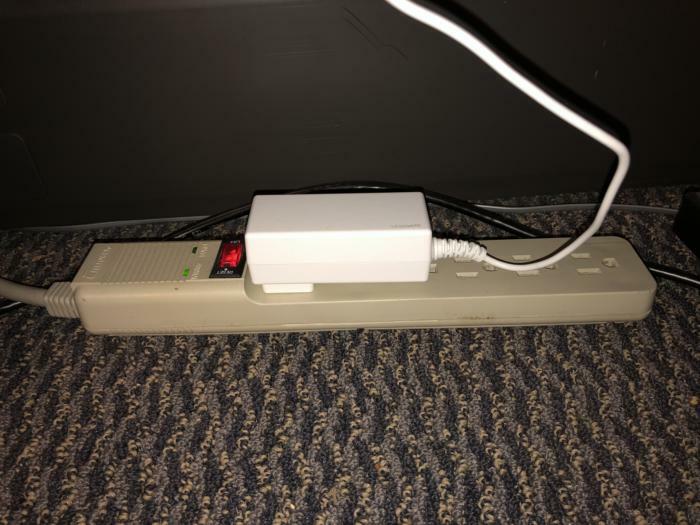 Belkin's power adapter tends to take up too much space on a power strip. The new charging pad also comes with a rather stiff price tag: $100.The company sells the charging pad in packs of four, though oddly enough there's no discount for buying in bulk. A four-pack retails for $400. All-in-all, Belkin's new BOOST↑UP Wireless Charging Spot is a solid piece of technology from a reputable tech vendor. It offers fast charging for Android and Apple devices with hideaway convenience and purported business-use durability. While I like the overall quality and design of the product, it could use some tweaks – including the price. But it's definitely ready for the boardroom today.